Environmental activist, fashion designer and artist Kuvan-Mills believes art and fashion impact our emotions and can move us to value our blue planet. 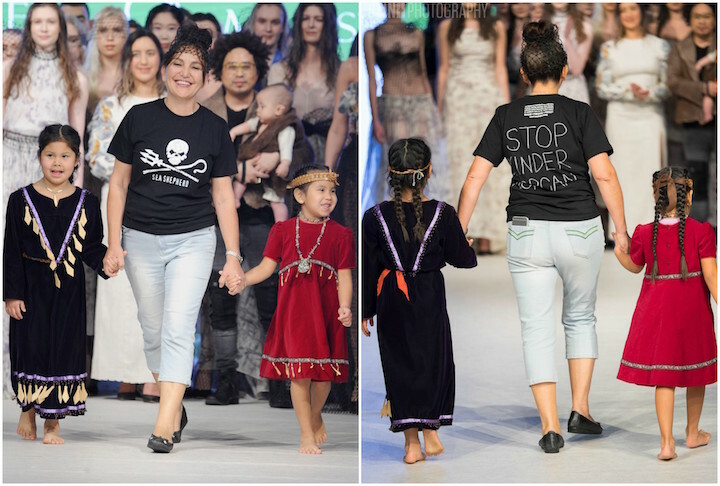 Currently supporting the world’s leading direct action ocean conservation organization, Sea Shepherd (Australia) she said she was compelled to return to west-coast Canada for Vancouver Fashion Week after hearing about the Kinder Morgan pipeline expansion and its threat to local waters. 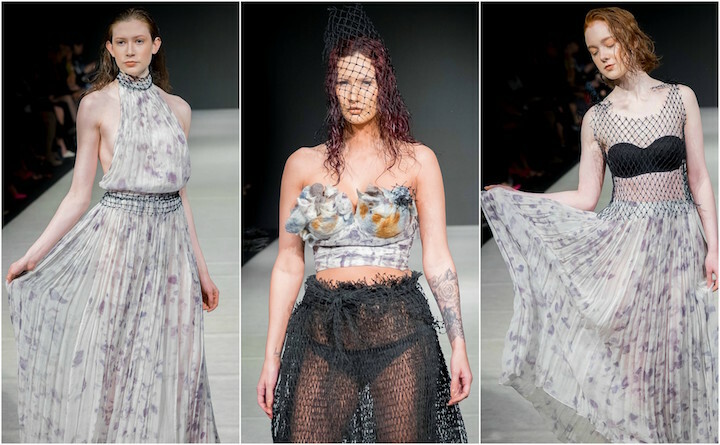 This is the Perth designer's fourth time down the runway of Vancouver Fashion Week, and her Empty Ocean's collection is in perfect sync with water conservation, and she wanted to share that with the Vancouver audience. "Vancouver has such a rich and beautiful coastline that should be protected for generations to come. I know that the First Peoples of its territory are as connected to their land and water," said Kuvan-Mills who connected with Charlene Aleck of Tsleil-Waututh First Nation during her stay. Aleck's daughter Ocean and granddaughter Maya, ad her niece Jasmine were asked to walk the runway. The three, are the great grandchildren of a the late native leader, Chief Dan George. The Tsleil-Waututh Nation is a Coast Salish band whose Indian reserve is located on Burrard Inlet in the southeast area of the District of North Vancouver, British Columbia, Canada. 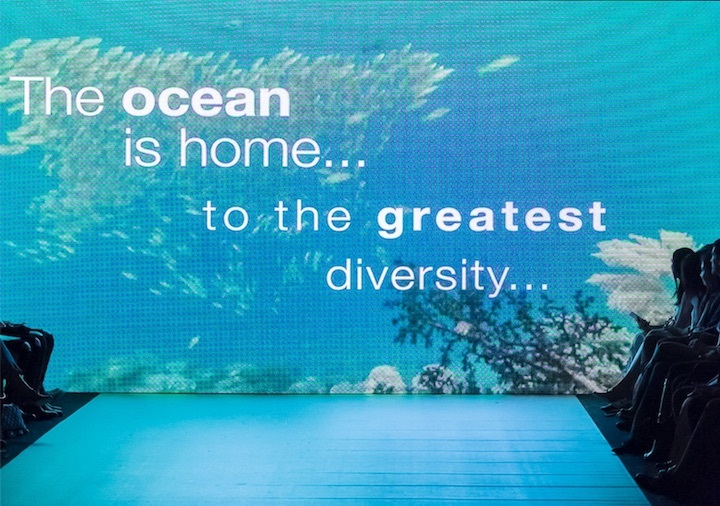 The Green Embassy F/W 2017 runway show opened with a poignant video by Conservation International which reminded us of the beauty of the ocean, and why we need her. As the video ended, the First Nation youth walked together down the runway in their traditional regalia covered by one large fishing net. 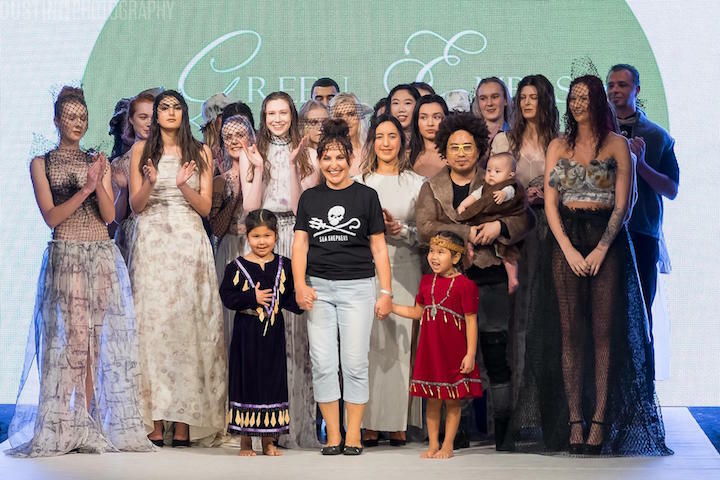 "I am grateful to the work of Zuhal Kuvan-Mills," said Charlee Aleck, who is an elected Councillor for her nation after the runway show, "'Empty Oceans' brings awareness to how we are treating/polluting our oceans, and the state of the Great Barrier Reef in Australia. She shares our concern and the imminent threats to our salmon bearing rivers and Salish Sea from the Kinder Morgan pipeline expansion. 'What will we leave our children?' Empty nets?" continued Aleck. "I feel truly blessed to have met this beautiful soul, the passion Zuhal has put into this very important message - water is life!" "I aim to support and help indigenous communities across the world," says Zuhal. "The children under the fishing net represents the future of the First Nations, they are being destroyed by all types of abuse and destruction to oceans," said Kuvan-Mills. "Black coloured fish net was selected to represent death and destruction to the natural environment (coastal waters) for First Nations. It was also over the children like a black cloud, as now they are under great danger of losing their coastal waters to pollution with yet another Kinder Morgan pipeline." It is her hope to create a collaborative event between the First Peoples of both Canada and Australia whereupon dance, music, fashion and the arts can be shared. Models graced the runway to a mix of sounds of First Nation drumbeats and Aboriginal didgeridoo. Fabrics were soft and flowing like water, in blues and ocean colours, or light and creamy like the sand and sea. Bow-ties, bows, sashes or sleeves were made from re-purposed fishing net remnants. 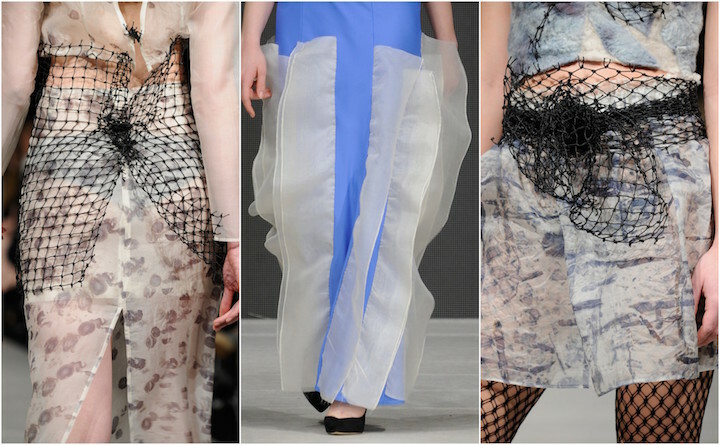 Some dresses were made of recycled polyester sourced from trash, plastic bottles, ad drift / ghost fishing nets. There were the lightest of silk pieces that whispered down the runway, while the woven items were strong and edgy like the ocean's coral and shells, or soft and warm like the sun's reflection on the shoreline. "I use real people along with my models," said Kuvan-Mills. All seen in these photos which includes local singing talent, Warren Dean Flandez and his family (center), are not models. 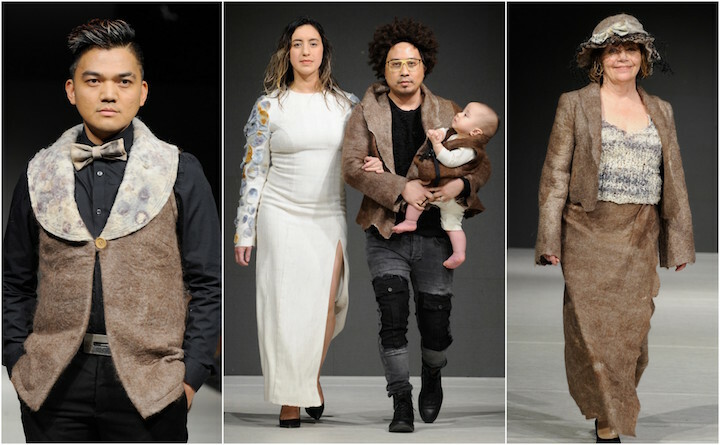 The fabric of many of the coats, jackets, hats and vests were collected, hand spun, processed and dyed by Kuvan-Mills herself on her farm in Perth where she raises alpacas, a domesticated species of South American camelid, similar to the llama. Her dyes are made from vegetation, like flowers, leaves, or vegetables, finding inspiration within the textile crafting traditions of ancient times. Green Embassy is Australia’s first internationally recognized organic fashion label who base their work on the protection of nature, and natural resources, while focusing on bringing public attention and education to environmental issues. 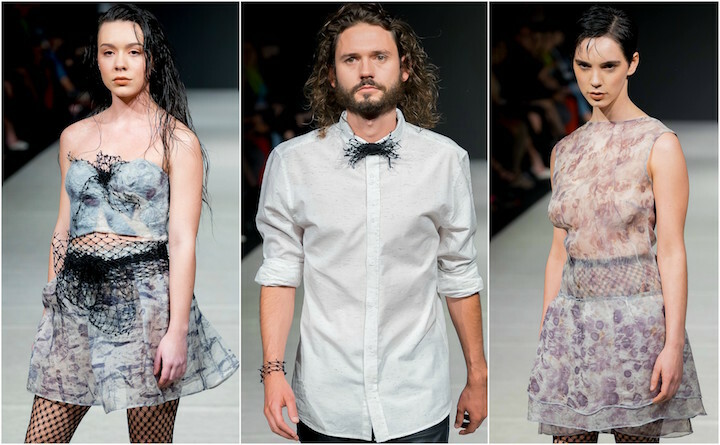 In November 2017, Kuvan-Mills will launch the inaugural Australia Eco Fashion Week in Perth. During her stay in Vancouver she explained her weaving and fabric dying methods to Kwantlen University and Blanche Macdonald, and met with many designers, to inspire them to turn toward 'slow fashion' and join her for the event. Green Embassy has been seen on the runway in Paris, London, Beijing and Vancouver, and with more and more concern being placed on fast fashion and the environment, Kuvan-Mills is quickly becoming a sought after guest speaker, and has been interviewed for television on SBS World News and national radio on ABC, Australia. In 2016, the Empty Oceans collection caught the attention of Pamela Anderson, who has her own foundation to help environmental causes. Kuvan-Mills' commitment to sustainability, organic agriculture, art and slow fashion is expressed in each extraordinary textile piece as a labour of love. TheBahamasWeekly.com is a media partner of Australia Eco Fashion Week, and we're excited to see what she delivers in Perth this November! "I am so very proud to be connected to this show and that my daughters were able to walk for this amazing designer who has so much heart, passion and vision..." said Bahamas Weekly editor / cofounder Robbin Whachell. Listen to a short clip of the designer talking about her dying process at a Vancouver media event. Watch video of part of the finale walk on the runway at VFW.